On days like today, I finally feel like I live in this city. I got up early (by my standards) because I had to do my Vietnamese homework before class. Most of it was translating sentences, and I’ve only learned basic greetings and counting, so google translate was quite helpful. I’m taking Vietnamese with Eric, another one of the pilots, and today was my third lesson. We had the same teacher as last week, and I really like her. She has cheekbones like miniature mangoes and a wide, expressive mouth. There are three sounds for the letters A and O, and two for E and U. None of the sounds are what I would expect. But, by watching her pronounce things, and sometimes drawing the shape of her mouth next to the letters, I’m finally catching on. The first O sound is like a mouth that is singing. The second is lips drawn together in a small o. And the third is like saying uh. I’m still confused about the A’s, but the U sounds are ooh (is in ooh and aah) and a sound that can only be made by jutting out my lower jaw. The first time I heard her say it I drew this sideways: ] and have never forgotten it. I don’t think it’s possible to speak Vietnamese without moving your whole face. She drilled us on numbers up into the thousands, saying the number in Vietnamese, then having us figure out what it was and spell it out with the correct accent marks. Compared to the first teacher we had, she is much more strict, telling me how to say, “how do you say X in Vietnamese?” and then expecting me to ask like that every time. It’s great though. 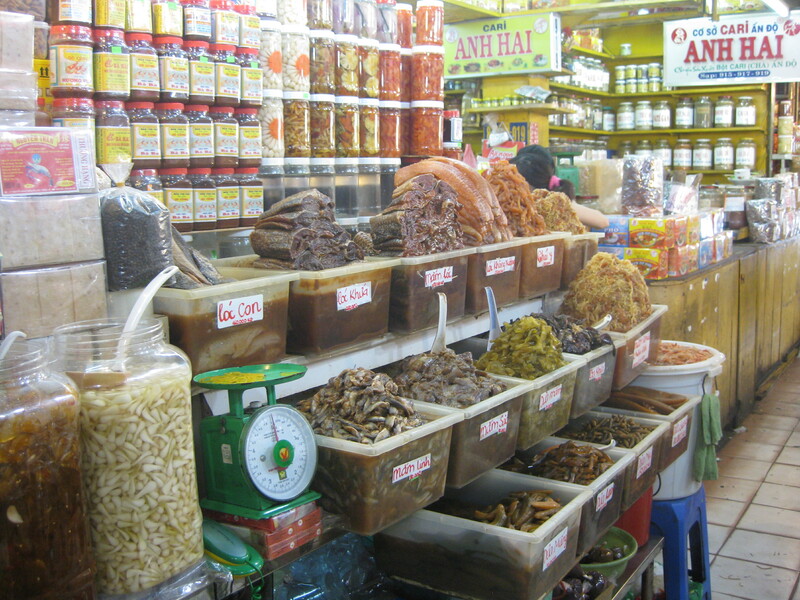 After class, I figured I should start Christmas shopping so Eric and I headed toward the heart of Saigon and the Ben Thanh Market. For being Communist, this city is surprisingly dressed to the nines for Christmas. Every store has trees, fake snow, and gifts piled around, and the main roads in District 1 have hundreds of poinsettias and thousands of lights lining them. In spite of this, it’s hard for me to get in the Christmas spirit. It might have something to do with the ninety-degree temperature. I’m not saying I miss the rainy cold of Georgia Christmases, but it feels like it’s six months away from Christmas – not two weeks. Armed with a fresh memory of words and phrases, we hit the market. This market is such a big part of the city, I feel like it is a being. It’s a tourist trap, but I know the locals shop there as well. It’s huge and nearly always swarming with people. 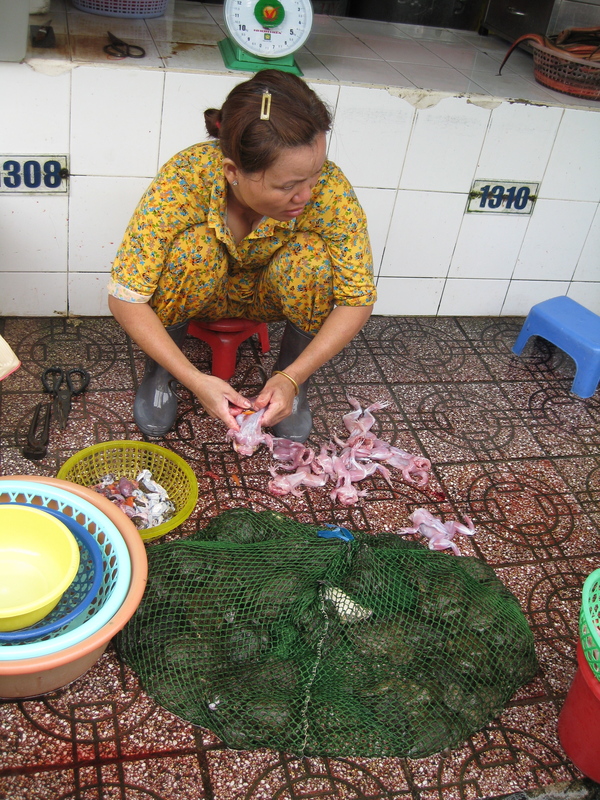 You can buy nearly anything there from live frogs (or skinned if you prefer) to Fuji apples, sheets to shampoo, bras to bamboo bowls, and watches to wire whisks. You can sit down and eat local food, or buy foods that I never imagined existed. Every time I go there I find a section I’ve never been in before. Jonathan hates going there because he doesn’t like the constant bombardment of people reaching for you and calling out to buy, and he doesn’t like to bargain. This is also where beggars (some sadly deformed) congregate, and the cyclo drivers won’t leave you alone. It can get exhausting, but the energy and people keep me coming back. I also think I got my mother’s bargaining gene. Most of the people are fun to deal with and bargaining is a game for them. As I walk through the narrow aisles, I am sometimes stepping over a person eating lunch, squeezing around groups of ladies congregated together chatting. 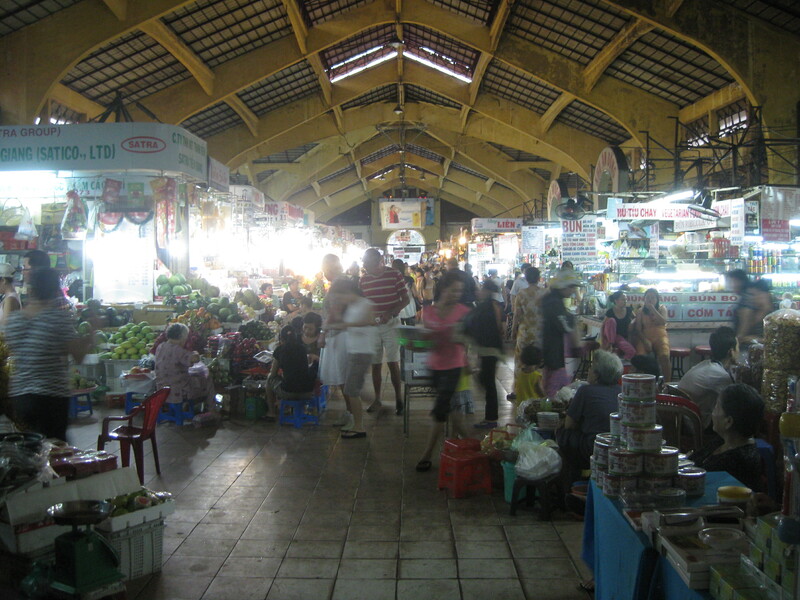 I get a sense of community among many of the people who work there, and I learned that some of the stalls in the market have been in families for generations. Most of the items are in sections, so if I’m looking for something particular I try to wander through the area first to see what’s available. I get the feeling the stalls on the main aisles are more expensive, but I’m not sure. The poor little live ones have to watch their friends get skinned. Yesterday, I stood looking at some shoes and was immediately offered a stool and asked what size I was. I started talking to her, telling her I lived here (otherwise all prices are in dollars and much more expensive,) and asking where she lived. I asked her name in Vietnamese (it’s Hein) which seemed to please her, and learned she is twenty-one. She said she thought I was much younger than twenty-nine, and didn’t think I would be married (I’m sure it’s a sales technique.) I showed her a picture from our wedding, and she exclaimed how handsome Jonathan is (all the girls here adore him,) and that she liked my hair much better that way. Me too, Hein. Me too. I explained the yellow hair disaster, and she understood. There was another girl working there and I asked if she was her em (little sister.) She said their mothers were sisters but didn’t know the English word for cousins. We started throwing prices around and I made her offers in Vietnamese. They both laughed, partially at my prices and partially because they think it’s amusing when we speak Vietnamese. She studies English in the evenings, and has worked at the market for a year and four months. She liked it in the beginning but now she said her boss is (I believe) strict. She expects it to be busy every day, even though Hein knows it’s not possible – that it’s normal to have slow days and busy days. I had learned the word for yell in class (la with no accent versus la´ which is leaf,) and she agreed. I wonder a lot about the working conditions and pay of the local people here. She was a good saleslady, and I hope to visit her again. Eric and I spent a while longer walking around town, picking up some things we wanted from the gourmet market – a $6 jar of salsa! and chocolate chips. 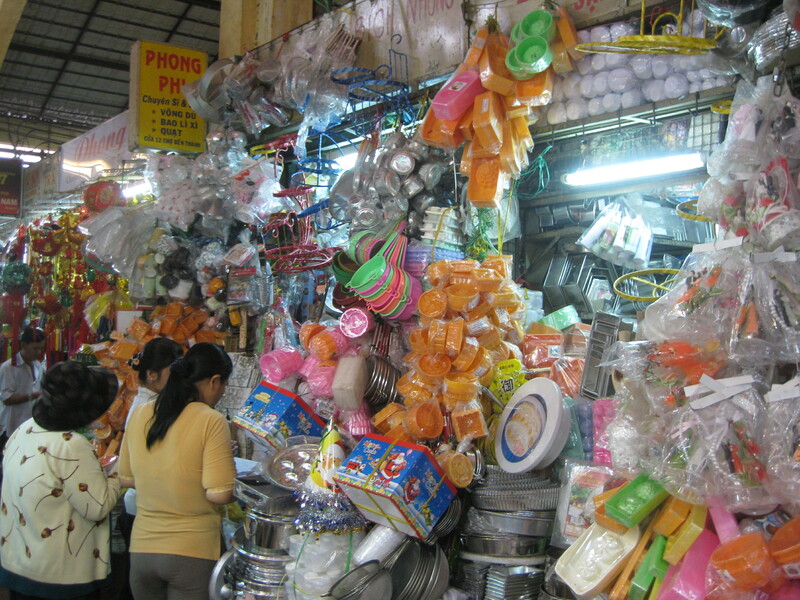 After that, we parted ways and I went to a different shopping area that only sells clothes and is more for the locals. Most of the stalls are run by younger girls/ladies, and they nearly always greet me with an enthusiastic smile. If I could learn to say “Do you have this in a bigger size?” I’d be able to get by without English. Most of the things make me look like a sausage squeezed into them, but occasionally you get lucky. They have a lot of brand name clothing, and I think most of it is legit. It is made here after all. I was excited to see Banana Republic clothes, but conveniently for the Vietnamese, they are all XS. On the way home, after two Vietnamese phrases from me (hello and turn left,) the taxi driver started rattling off something back to me. I was pleased he hadn’t realized that was the extent of my language skills. Last week I bought a tiny teapot at this stall and bought some jasmine leaves and lotus leaves, so now I sit enjoying my Atlanta mug full of jasmine tea. You make yo mama proud. Frogs don’t make friends. Only Kermit does that. I hope they were killed before being skinned. Gruesome to think of now.